Flora Mildred Cartwright was born on 1926 in Liverpool, England, UK. The youngest of four children, Flora and her family lived in the same house until she was a teen. In 1949, she graduated from Liverpool University, where she met Robert Kidd, her husband. They moved to her beloved Scotland, where she began teaching, writing, and raised their four children: Richard, Patricia, Peter and David. 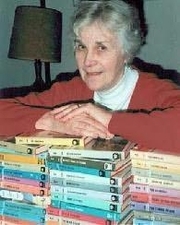 Flora Kidd published her first novel, Visit To Rowanbank, in 1966 at Mills & Boon. In 1977, the family moved to Saint John, New Brunswick, Canada, where she continued her romance career with Mills & Boon until 1989, when she retired. In 1994, she published the first of the The Marco Polo Project novels, to support a project to build a replica of the 19th century ship Marco Polo. Flora Kidd passed away on March 19, 2008 at Saint John, New Brunswick, Canada. Flora Kidd is currently considered a "single author." If one or more works are by a distinct, homonymous authors, go ahead and split the author. Flora Kidd is composed of 3 names. You can examine and separate out names.